Advanced Gear Manufacturing and Finishing offers detailed coverage of advanced manufacturing technologies used in the production of gears, including new methods such as spark erosion machining, abrasive water jet machining, additive layer manufacturing, laser shaping, and sustainable manufacturing of gears. The industry in this area is constantly producing new settings where gears must endure ever increasing stresses, strains, and temperatures. Advanced methods in manufacturing, finishing, and surface property enhancement have emerged in recent years to meet these challenges. 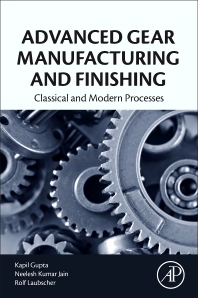 This unique book takes a critical look at the state-of-the-art research into these new methods, and the latest improvements to classic technologies in both gear manufacturing and finishing. This book is essential reading for researchers and engineers working in the fields of powertrain manufacturing, gear technology, and advanced manufacturing technologies. Describes the machining systems, main components, and working procedures with the help of diagrams and photos. Demonstrates the mechanisms and capabilities of new methods. Shows improvements to a range of gear manufacturing and finishing technologies. Provides a critical review of recent research in a range of fields relevant to gear manufacturing technologies. Kapil Gupta is a Senior Lecturer in the Department of Mechanical & Industrial Engineering Technology at the University of Johannesburg. His general research interests include precision engineering, microfabrication, sustainable manufacturing, green machining, and gear technology. Neelesh Kumar Jain is a Professor of Mechanical Engineering and Leader of the Centre of Excellence in Gear Engineering at Indian Institute of Technology Indore, India. His research interests include advanced and micro machining and finishing processes, gear finishing, micro-plasma based layered manufacturing and joining and miniature gear manufacturing. Rudolph Laubscher is an Associate Professor in the Dept. of Mechanical Engineering Science at the University of Johannesburg. He has over 10 years experience in lecturing and research, primarily in physical metallurgy, non-linear FEA, strength of materials, and metal cutting.